Knockerball™ is a single chamber inflatable sphere with inner handles and adjustable shoulder straps. Knockerballs™ range from 1.2 Meters to 1.5 Meters and the size or fit is predicated on your height. Knockerballs™ can be used singularly to perfect your rolls, flips, and wheels. “KnockerBallers” describe the sensation as almost defying gravity, just imagine the sensation and mobility that a Knockerball™ allows you to experience without putting any stress on the body. 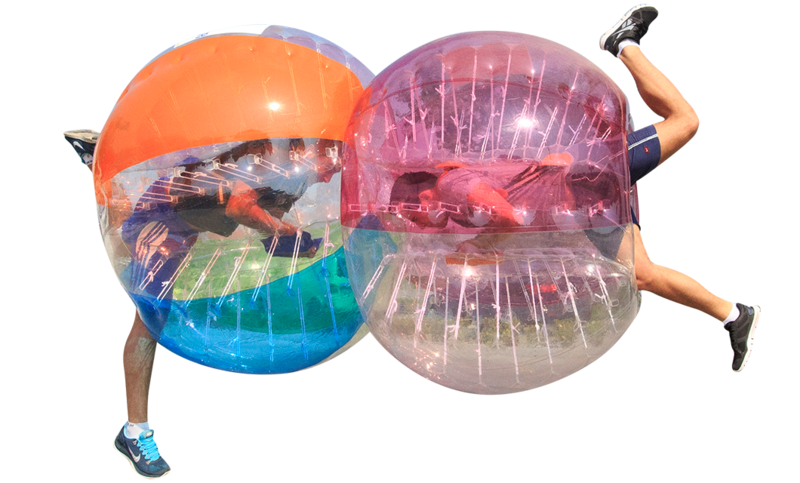 With two or more Knockerballs™ the experience is catapulted into rip roaring laughter, exhilarating knocks and rolls that will keep you coming back for more. Organizing a KnockerSoccer game is truly a blast but we will warn you, organized games generally break down into literal knock down chaos with the only resulting pain being from laughing so hard and having way too much fun. Open Space to Safely Have Fun!